Design your walls with photos or advertising wherever you want: at home, at stores, at waiting rooms or galleries. Wall tattoos can be used in various ways: at stores, at waiting rooms, in the office or in galleries. Give your walls a colorful and individual design with photos or advertising and use free space to decorate or advertise. The wall tattoos are repositionable while mounting, but not reusable. The wall tattoo will be produced in your ordered size according to your printing file. The max. printing width for a rectangular motif and stickers with a cut contour is 1.25m. Up to these values the stickers are produced in one piece. All larger dimensions will be divided according to our data sheet. Contour cut is possible and already included in the offer. 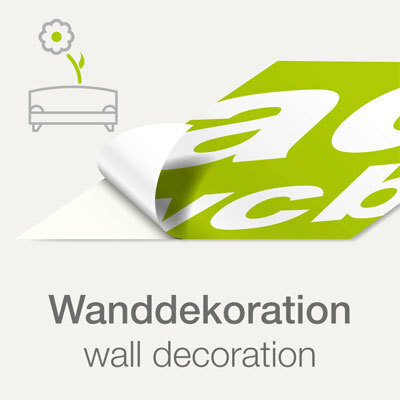 For decoration on smooth walls. Not usable for rough surfaces. Do not apply sticker to fresh painted walls, wait at least 7 days. We recommend only a partial application up to max. 50% of the glass surface. When the sticker foil is applied completly on a glass pane you cause a risk of fracture! You can find further information in our data sheet.